More advanced than the SOMATOM Emotion 16 CT, the Siemens Sensation 16 mobile CT scanner offers the fastest scanning times in its class, capable of performing a whole body 3D image scan of a patient’s arteries in less than 20 seconds with 0.75mm slices. The Sensation CT mobile CT scanner also features a Straton X-Ray tube, which has fast cooling rates and a lightning quick 0.37s rotation time. In addition to its scanning times, the Sensation 16 scanner boasts the innovative z-Sharp technology, which allows whole body or organ-specific images with excellent clarity and detail at high volume. A 70cm aperture entry optimizes patient comfort, reducing instances of claustrophobia while ensuring adequate space for obese patients. 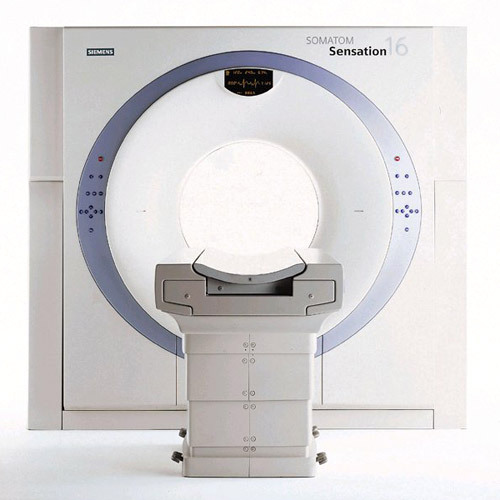 The Sensation 16-slice CT scanner is a higher-end scanner than that of the Emotion 16-slice CT from Siemens. The Sensation has the fastest scan times in its class and provides excellent image resolution. The tube cools faster than prior models and has proven to have longer life.